The Internet of Things (IoT) is still in its infancy when compared to web technologies. Many devices or things as IoT refers to them have been connected to some type of system easily for the past 20-30 years. However, connected can be anything from someone manually replacing EEPROM’s to update firmware or devices connected to serial networks with speeds up to 9600 baud rates. Simlilar to how our company 56K.Cloud discovered our name. In other words still worlds behind the web. Connecting devices to the internet which are off-line, using non-web protocols, or using legacy hardware can be challenging. However, the goal of IoT is to bridge the gap between devices and the internet. Yes, sounds simple enough but this is where we need to fill the gap. Consumers take for granted that all devices should and must be internet capable. In the business world like office buildings, factories, and farms they commit to hardware life-cycles which can be 20+ years. So the question is how do we enable industries with web technologies down to such devices? Next, how do we bridge the gap from the device to the internet? It is a massive challenge that has just as many use cases and devices. How does the industry standardize the delivery and management of all these devices? If you search Google, you discover 100’s of companies which claim to solve the problem. In reality, few companies have solved this and instead try to sell up new devices or technologies which is not addressing the original challenge of connecting existing devices to the internet. Challenge Accepted The answer is simple. Businesses need an intermediate step to the end device better known as a Gateway or Edge device, but in this article, we refer to it as Edge. It allows us to have a standard deployment of software which is the connection point to all devices at the customer’s location. The Edge can also contain multiple interfaces which can handle serial, Mesh networks, LoRA, or other networking methods to the device. 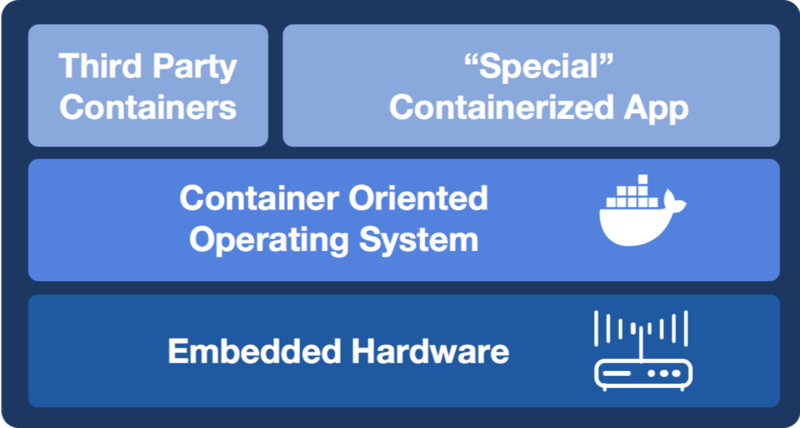 When we introduce containers to the IoT DevOps pipeline, we can extend the DevOps pipeline to the Edge. In essence, the IoT DevOps pipeline can provide DevOps to office buildings, factory floors, or farms. By enabling DevOps directly to businesses brings along with it a ton of value like velocity, security, and drives a cultural change within organizations. Once we can create and deploy standardize application stacks to Edge devices, customers can focus more on their value generating applications rather than focusing on maintaining infrastructure. The software delivery pipeline now can generate significant value while customers can focus on delivering features and enabling new application development rather than waiting weeks, months, or years. We hope you found this guide helpful. If there is anything you would like to contribute and/or have questions, please let us know!